When it comes to Audrey Hepburn and fashion, you don't need to have seen a single one of the star's films (although you should treat yourself to a few) to understand why she remains a style icon long after her heyday. Like Jacqueline Kennedy Onassis and Coco Chanel, she had a strong fashion sense that captured the imagination of millions of other women and continues to have an impact. Audrey Hepburn was a great beauty - tall and slim, with a pixie haircut that drew more emphasis to her strong cheekbones and big, dark eyes. She was naturally slim, not starved like so many modern actresses. Her grace was born of a dancer's training and it meant that she wore even the simplest item of clothing with extra flair. 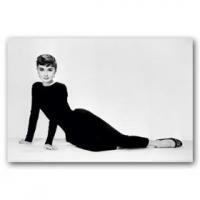 Simple was, in fact, the byword by which Audrey Hepburn lived when it came to her look. She favored clean lines and a slim fit in plain colors. Many of her clothes were inspired by the look of men's wear, but it all had a distinct and absolute femininity. The first visual many people will have when thinking about Audrey Hepburn and fashion is of her iconic outfit in the film Breakfast at Tiffany's. Wearing a body-skimming, sleeveless black dress worn with white opera gloves and accessorized with a big hat, sunglasses and a long cigarette holder, she is the embodiment of glamour. These days, a wise woman would forgo the cigarette holder and the cigarette, but the rest of the look is timeless and beautiful. Coco Chanel had originated the idea of the little black dress, that perfect item that every stylish woman had to have, and Audrey Hepburn showed women how it could continue to be worn to great effect in a new era. The 1950s are famous for colorful dresses in bold patterns cut in wide skirts. The excess of fabric and femininity was a natural response to the forced austerity of the war years in the 1940s. 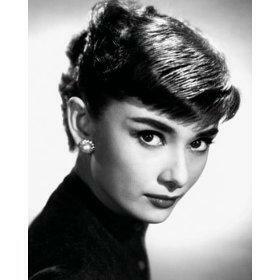 But as the decade went on, artists and Beat poets embraced another look, which Audrey Hepburn then made world-famous. In a black turtleneck, black capri pants and black ballerina flats, she was breathtaking. She first made the Capri and ballet flat look popular in the film Sabrina and it's a look women continue to adore and try to emulate. In the 1950s, especially for younger women, it was exciting to opt for something so simple and elegant, rather than wear all the heavy foundation garments and layered dresses that had ruled the day till then. These days, women often still gravitate towards simplicity. A good pair of well-cut capris will go with almost anything - you can even throw a dress over them. They have become a wardrobe staple, the only season in which they don't work well is winter. Capris, flats and slim black dresses are the epitome of Audrey Hepburn and fashion influence, but long before Diane Keaton set new fashion standards in the 1970s with her own iconic looks in Annie Hall, Audrey Hepburn was wearing button-down men's style shirts, first in the film Roman Holiday. Her easy look of a plain white shirt worn open at the collar and accessorized with a jaunty scarf became a sensation. It remains a great look today. A classic tailored button-down shirt worn with a scarf can be dressed up with a skirt or wool trousers and a jacket, or dressed down with jeans and a cardigan. Either way, it's very chic. The designer Givenchy developed Audrey Hepburn's costumes for Sabrina and was immediately impressed with her sense of self and style. With her help, he designed the famous boatneck dress she wore so beautifully. For women with prominent collarbones, it's a very flattering style. To the end of her short life, Audrey Hepburn was all about sleekness and sophistication in fashion. Trends come and go, but the Audrey Hepburn style remains in vogue.